The issue remains unresolved as to whether low frequency magnetic fields can affect cell behaviour, with the possibility that they may be in part responsible for the increased incidence of leukaemia in parts of the population exposed to them. Combined treatment of HeLa cells with gamma-irradiation (1, 3 and 5 Grays) and extra low frequency magnetic fields of ~50 Hz was carried out under rigorously controlled conditions. Synchronised cells progressing from S-phase arrived at mitosis on average marginally ahead of irradiation controls not exposed to ELF. In no instance out of a total of twenty separate experiments did this "double-insult" further delay entry of cells into mitosis, as had been anticipated. This apparently "non-genotoxic" agent (ELF) appears to be capable of affecting cells that would normally arrest for longer in G2, suggesting a weakening of the stringency of the late cycle (G2) checkpoint. Some epidemiological studies purport to show a relationship between cancer incidence and environmental exposure to extremely low frequency (ELF) electromagnetic fields (EMFs) [1, 2]. Others have failed to find a correlation [3, 4], and Campion  and more recently Park  have concluded that any association is probably far too tenuous and insignificant to warrant further investigation. The inability of laboratory studies to provide convincing evidence that ELF fields can alter cells seems to support such a view. Negative evidence proves little, and despite such statements, a nagging concern that some as yet unexplained ability of ELF-EMFs to modify cellular processes, such as implied by the enhancement ("promotion"?) of leukemogenesis in man. Without some clear endpoint to measure, few have known where to begin in a systematic laboratory approach, which is made worse by the lack of a tangible hypothesis. Ionising radiation is undoubtedly associated with carcinogenesis, since it is known to increase the rate of genetic mutation and thus the incidence of cellular defects leading to the emergence of malignant phenotypes. Environmental exposure to ELF-EMFs is reputedly far too weak to cause genetic damage  and in vitro assays of mutagenicity have been negative . However, since not all carcinogens have to be genotoxic, it is possible that some agents participate indirectly in the induction of genetic changes required to bring about carcinogenesis. The spontaneous gene mutation rate in human cells is high and mechanisms operate which repair these errors, thereby reducing genomic instability, with the incidence of cancer being orders of magnitude higher in their absence . Damaged cells can either engage a programmed cell death pathway, effectively committing suicide [10, 11], or arrest in cycle until the damage is repaired during the "time-out" response to the so-called DNA damage cell cycle checkpoints [12, 13]. While both mechanisms help maintain genomic stability, they themselves are targets for non-genotoxic carcinogens. Of the two main checkpoints, the one in G1 largely prevents duplication of genetic errors, whilst the one in G2 stops cells entering mitosis with damaged chromosomes. Loss of checkpoint stringency is a feature of oncogenic transformation [14, 15]; the gene encoding the p53 tumour suppressor that plays such a pivotal role in the G1 DNA damage checkpoint is mutated in >50% of human cancers , with inactivation of the protein itself by association with viral oncoproteins accounting for many others. Indeed, p53 knock-out mice spontaneously develop a high frequency of tumours [17, 18] due to failure in G1 arrest following DNA damage [19, 20], with a resultant predisposition to gene amplification and genetic instability [21, 22]. Conversely, if "proliferative impetus" is maintained when cells should have arrested in their cycle because of reduced checkpoint stringency, this may lead to the propagation of either somatic or induced mutations, which is a hypothetical mechanism for non-genotoxic carcinogenicity. 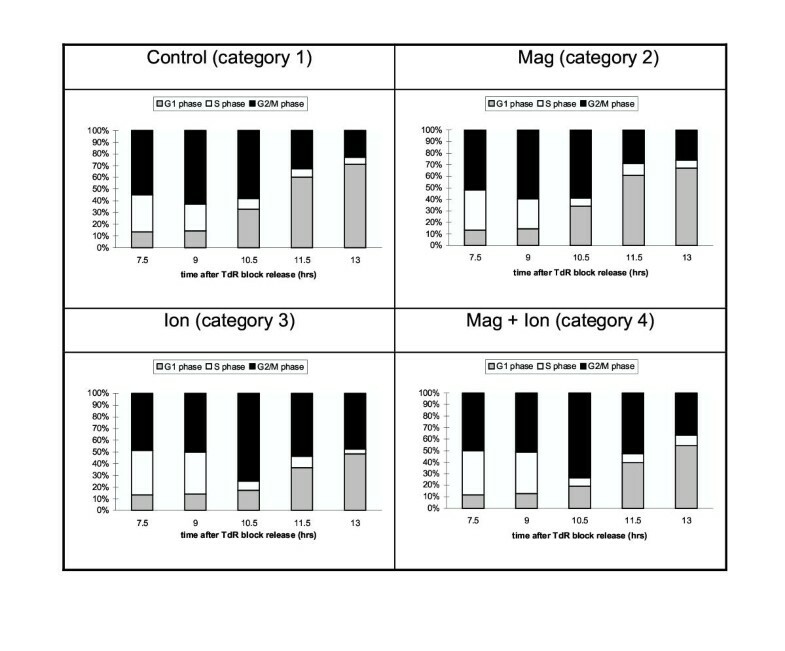 Extensive cell proliferation studies that we have carried out over nearly 5 years have yielded only negative results when cells have been exposed to 50 Hz, 2mT magnetic fields for up to 72 h, i.e. no discernible effect of the fields. In agreement with the majority of published results, studies on the growth-related enzyme, ornithine decarboxylase, in murine L929 fibroblasts show it was unaffected [, and unpublished data], contrary to the findings of Litowitz et al. . However, when cells were subjected to a mild thermal stress (39°C) at the same time as being exposed to 50 Hz magnetic fields for up to 72 h, a small increase in the rate of proliferation was noted compared to cultures subjected to only the small rise in temperature . This effect was seen for magnetic field intensities ranging from 100 μT to 2mT and suggests that cell proliferation/behaviour could be modified by ELFs in cells already responding to another environmental stress. Two previous reports have explored a similar approach. Hintenlang  found an increase in near tetraploid chromosome complements in human lymphocytes irradiated with doses of up to 4Gy from a 137Cs source which were subsequently cultured in 60 Hz magnetic fields of up to 1.4mT, providing evidence that cellular mechanisms of radiation damaged cells could be modulated. And Rosenthal and Obe  found a significant increase in the frequency of sister chromatid exchanges in human lymphocytes pre-treated with antineoplastic drugs and subsequently cultured in a 5mT 50 Hz field, which is highly relevant to our finding (see Discussion). We surmised that a double insult would further delay the entry of irradiated cells into division in synchronized HeLa cultures when an ELF magnetic field was also applied. HeLa cells are demonstrably deficient in the G1 DNA damage cell cycle checkpoint  due to PHV E6 inactivation of p53 [29, 30], allowing the effect of magnetic field exposure on the stringency of the G2 DNA damage checkpoint to be analysed in isolation. The G2 block is a universal cell response to DNA damaging agents [31–34], showing that this checkpoint is susceptible to partial loss of stringency rather than complete inactivation. Cells released from double thymidine block were irradiated 4 h later in mid-S phase with 1, 3 or 5 Grays of gamma radiation. These levels might be considered high in these studies, but were chosen after preliminary experiments were done because they produced the most consistent delays in the entry of cells into mitosis. 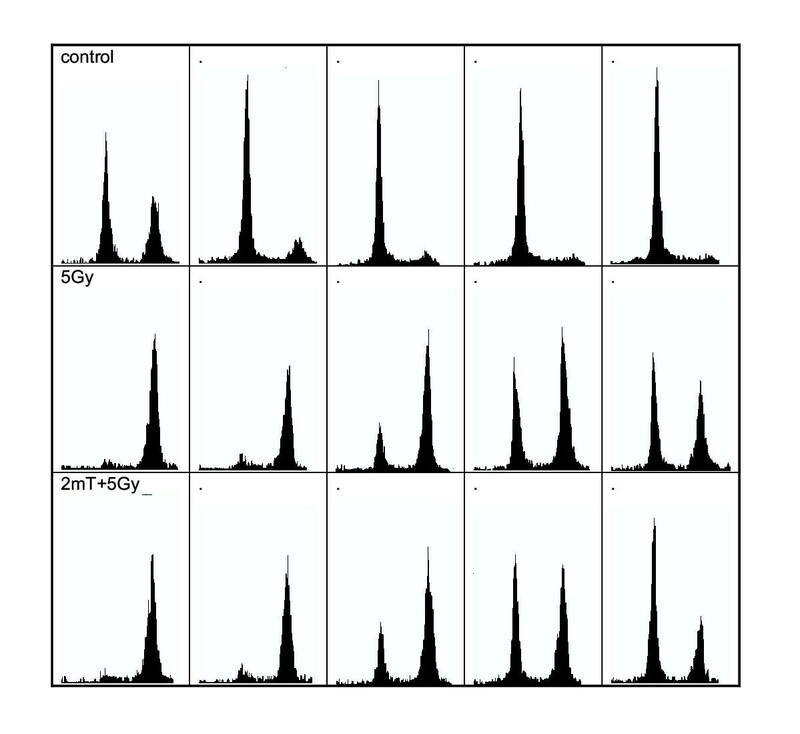 Once irradiated, the incubation was continued with or without continuous incident magnetic fields, and the appearance of post-mitotic G1 cells was monitored by flow cytometry at various times up to a maximum of 24 h (field characteristics shown in Fig 1; see Material and Methods section). A : Magnetic field distribution in the vertical plane; (- - - - -) represents the boundary of the ± 2.5% cylindrical uniform magnetic field; (- - -) represents the boundary of the sample holder. B: Magnetic field distribution in the horizontal plane demonstrating cylindrical symmetry; (- - - -) represents the boundary of the ± 2.5% cylindrical uniform magnetic field; (- - -) represents the boundary of the sample holder. Figures 2 to 8 show the results as determined by flow cytometry. Cells released from the double thymidine block at time-zero that had not been exposed to gamma-radiation (Group1) completed mitosis on schedule within 12 h . The magnetic fields of 2mT (Group 2) had no effect on their progression into division. Gamma-irradiated cells slowly regained their ability to enter and complete M-phase, but were considerably delayed compared to Groups 1 and 2, as seen in the subsequent 24 h follow-up period (Group 3). Irradiated cells that were also incubated in the presence of a 2mT magnetic field (Group 4) similarly showed a considerable delay in progressing through mitosis. However, decomposition of the flow-cytometry histograms suggests that the cells were entering G1 earlier that their matched controls (Group 3), which would only be consistent with a reduced G2 checkpoint stringency. Further, this effect was more prominent with increasing doses of gamma radiation. Out of a total of over 20 experiments, 80% showed this effect; equally noteworthy is that in no experiment was the reverse seen. Table 1 gives the statistical analysis showing the significant difference between Groups 3 and 4. ELF-EMFs of environmentally significant field strengths (~2mT) shortens the pre-mitotic delay following DNA damage in HeLa cell cultures prevented from reaching mitosis on schedule by gamma-irradiation. Since EMF treatment alone lacked any discernible effect, it is clear from this work, as in our previous studies, that biological systems like this have to be rendered exquisitively sensitive to environmental agents before any discernible effect of an agency such as ELF-EMFs might be detected. In human populations at risk to leukemia, irrespective of the causative agent or the genetic disposition of the individuals to this disorder, a low but consistent frequency of cancer itself indicates that the system is delicately poised, and hence the influences of a non-genotoxic agent, such as ELF-EMFs, could operate by compromising the late cycle checkpoint under these circumstances. Such an effect might well be "felt" in a population in which the background incidence of cancer in the most susceptible early age-groups was low, even with an apparent doubling in the incidence of the disease. Furthermore, if attenuation of the G2 checkpoint can be implicated as one possibility, by inference it follows that the same is probably true of attenuation of the other major cell cycle checkpoint in G1 (the R or Restriction Point), shown to be exacerbated by the action of non-genotoxic agents such as phenobarbital by Gonzales et al. . This has in fact been proposed as the primary mechanism of this drug's well-recognised effect on carcinogenesis. Thus deficiencies in crucial cell cycle control mechanisms allow the propagation of genetic defects and contribute to the increased genetic instability leading to cancer. These observations therefore define a novel and plausible mechanism by which ELF-EMFs might also be included as a non-genotoxic carcinogen. Despite the "artificiality" of our test system and the levels of these agencies being considerably above those that might be encountered in nature, the very fact that delay in mitosis is not exacerbated by a double insult, but in general is reduced, has obvious implications which cannot be ignored, even if these findings are in no way directly translatable into possible environmental reasons for increased "genotoxic"/carcinogenic sequelae. To date we have no explanation as to how these EMFs might alter pre-mitotic activity at the molecular level. Previous data on the effects of ELF in synchronised Tetrahymena cell cultures seemed to indicate the initially expected extra delay caused by a second insult. However, these organisms are exceedingly sensitive to heat and a 1.6°C rise in temperature in the active coil delivering ELFs was found to be responsible . We have circumvented this problem here by introducing fans that stabilise the temperatures within the active and inactive coils at exactly the same level within the hot room, and allow us to adjust down the room temperature should it rise to an unacceptable level. But the involvement of a very small heat-shock is much less likely to affect mammalian cells, many of which have a growth optimum of ~38.5°C. Since the usual outcome of raised temperatures is an exacerbation of any additional physical or chemical insult on the cells, ELF once again seems to be doing the very opposite in our experiments by reducing rather than further protracting the inevitable delay due to irradiation. In brief, the differences between Groups 3 and 4 cannot be attributed to temperature asymmetry. We surmised that cyclin B/p34cdc2 kinase activity would show no difference between Groups 1 and 2, indicating that ELFs alone do not increase kinase activity. The G2/M transition is catalysed by cyclin-dependent kinase (cdk) (p34cdc2) , activity of which is principally regulated by association with cyclin B  and a series of phosphorylation/ dephosphorylation reactions [39, 40]. In Groups 3 and 4 we had initially expected a drop in kinase activity following irradiation followed by a steady rise with time as the delay elapsed and cells prepared for division. But in three all experiments performed, we found that Group 4 kinase activity, assayed by a modification of the method of Matsushime et al. , rose above that in Group 3 at an earlier time (6 h), commensurate with a faster transit into division. However, these experiments did not show statistically significant elevations in each case, hence more conclusive results cannot be reached until further work is done. However, it can be reported that in no instance has the cyclin kinase activity of ELF-exposed cells lagged behind the sham-exposed controls in either the X-irradiated or non-X-irradiated groups. An increase in cyclin B phosphorylation would be commensurate with a shortening in ELF-EMF treated cells of the G2 delay, and would confirm the otherwise seemingly counterintuitive finding to the expected further protraction of this period, and implicating magnetic field in reducing the stringency of the G2 checkpoint. Increase in cyclin B and/or cdk1 expression demonstrably accelerates G2 progression, and clearly more exacting work now needs to be done on gene expression under these conditions, with emphasis on expression of the mRNA of these proteins. The absence of an observable effect upon unirradiated cultures implicates the arrest-response mechanism itself (i.e. the damage sensor, the signal transduction pathway, cak inhibition, or whatever) as the primary site of action. While these processes remain relatively obscure, others have reported that magnetic fields can have profound effects upon a diverse group of cellular processes. Therefore interrogation of this control complex and its suspected modulation by ELF is an important focus for future work. At present it is unlikely that these studies can be repeated and extended to test our hypothesis, unless more serious attention is paid to its implication. We concede, however, that we have not demonstrated that ELF increases the incidence of cellular transformation. Indeed, our cell system – which already exhibits a highly deranged malignant phenotype – might be considered a far less acceptable cell type than normal phenotypes which have been chosen for such demonstrations in other cell systems [24, 36]. Equally, the absence of a functional G1 DNA damage control and the lowered stringency of the G2 checkpoint in HeLa cells (although the relative "intactness" of the G2 checkpoint cannot be disputed since these cells nevertheless arrest pre-mitotically following any disturbance in their preparation for division) may also have influenced the responses observed. While we feel that cells of normal phenotype may prove superior "models" in future work, it can be argued that work on transformed cells is still relevant because ELF might require some predisposition of cells (or some point of inherent/ induced genetic instability) which becomes further unbalanced and gives an abnormal response sooner than otherwise expected, and from which aberrant subclones of a more anaplastic nature arise. Thus the recent work of Still et al. on Jurkat cells, which are highly sensitive to their environmental conditions, may itself be a valid approach, although in this latest study these authors saw no clear difference between Ca2+-dependent gene expression in exposed cells which might have arisen from previously reported changes in intracellular free Ca2+ levels . We also concede that at present these time-consuming experiments have allowed us little opportunity to explore more comprehensively doses levels and different treatment schedules using the two agencies. Also agencies other than gamma-irradiation need to be carefully considered. Nevertheless, we believe that our data demonstrates for the first time an unanticipated effect of ELF on a cellular response to incipient injury. The hypothesis that ELF might be capable of exacerbating an inherent or induced genetic instability by reducing or attenuating the stringency of the late-cycle (G2) checkpoint, allowing cells to progress into and sometimes through mitosis before pre-mitotic inflicted damage has been adequately repaired, may well be testable in other more sensitive ways and within other systems. 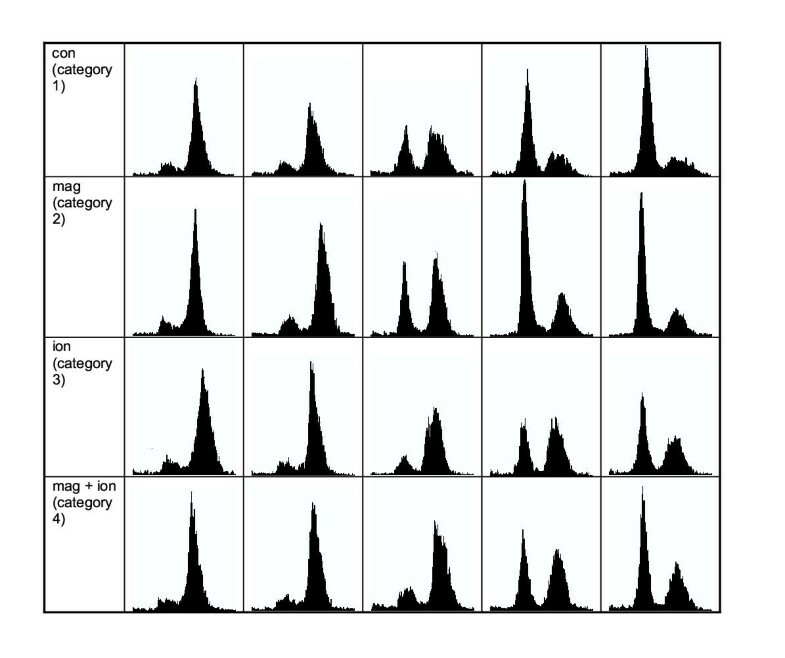 Flow cytometry histograms of synchronised HeLa S3 cells. 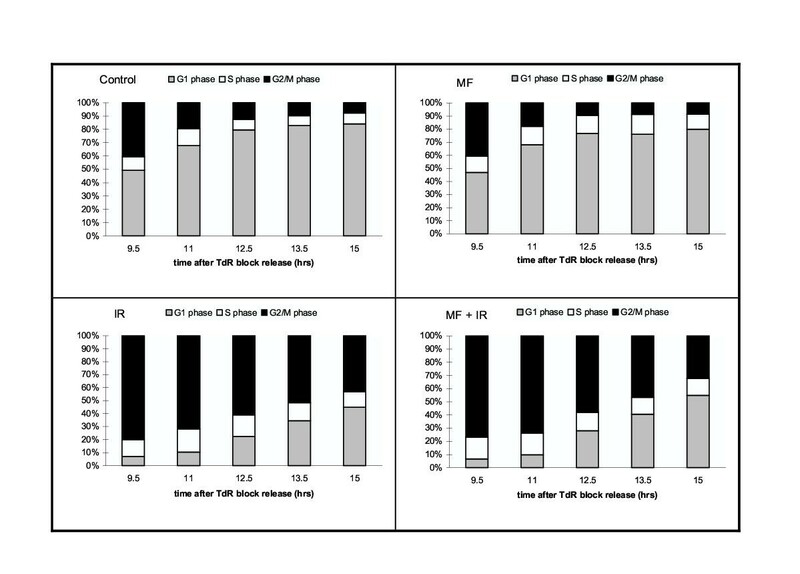 From left to right the histograms correspond to 7.5, 9, 10.5, 11.5 and 13 h after release of the second thymidine block. Categories 3 and 4 have been irradiated with a dose of 1 Gy in early S-phase. 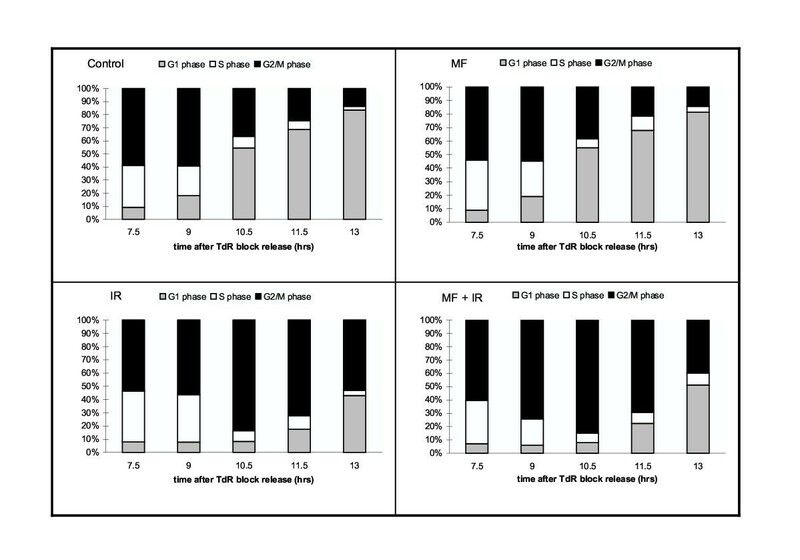 Bar charts illustrating the proportion of cells at different stages in the cell cycle derived from the decomposition of flow cytometry histograms. Irradiated cells have been given 1 Gy in early S-phase. 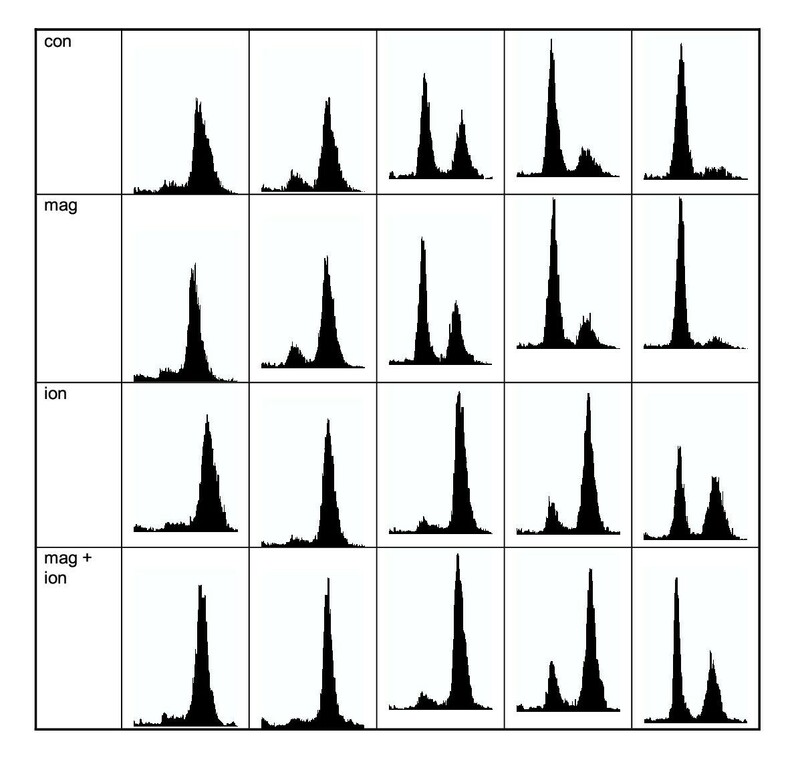 Flow cytometry histograms of synchronised HeLa S3 cells. 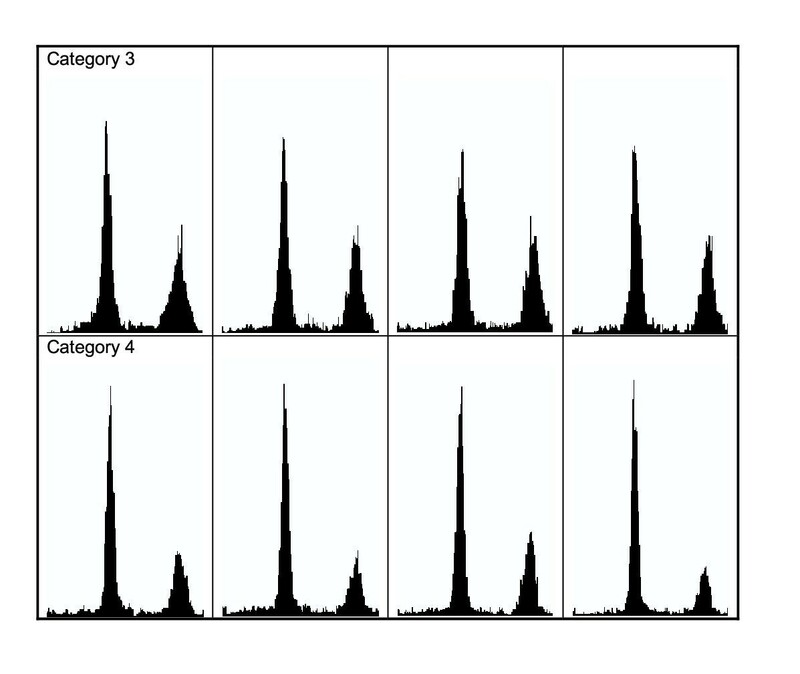 From left to right the histograms correspond to 7.5, 9, 10.5, 11.5 and 13 h after release of the second thymidine block. Categories 3 and 4 have been irradiated with a dose of 3 Gy in late S/early G2 phase. Bar charts illustrating the proportion of cells at different stages in the cell cycle derived from the decomposition of flow cytometry histograms. Irradiated cells have been given 3 Gy in late S/early G2 phase. Flow cytometry histograms of synchronised HeLa S3 cells. From left to right the histograms correspond to 9.5, 11, 12.5, 13.5 and 15 h after release of the second thymidine block. Categories 3 and 4 have been irradiated with a dose of 5 Gy in early S-phase. Mycoplasm-negative human cervical epithelial carcinoma (HeLa) cells, certified as this cell type, as required by the UKCCCR guidelines, were cultured in DMEM (4.5 g l-1 modification) supplemented with 10% calf serum, 80 μg ml-1 streptomycin and 100 units ml-1 penicillin at 37°C in a humidified 5% CO2 atmosphere. Cells were synchronised at the G1/S boundary by double thymidine block, as in our previous studies . Cells were cultured in a 50 Hz, 2mT root mean squared electromagnetic field applied perpendicular to the cell monolayers and generated with a Helmholtz configuration of coils. Two Helmholtz pairs were used so that samples could be either exposed to an applied magnetic field or sham exposed, i.e. identical environmental conditions but without magnetic field exposure. The homogeneity of the field in the coils is shown in Fig. 1A and 1B. Measurement of the magnetic field conditions, including both time-varying and static fields, was made using a search coil type sensor and a Bartington's MAG-03MC Fluxgate Magnetic Field Sensor. Both had calibrations traceable to national standards. Measurements of the perpendicular components of the background time-varying fields and the static fields are shown in Table 2. 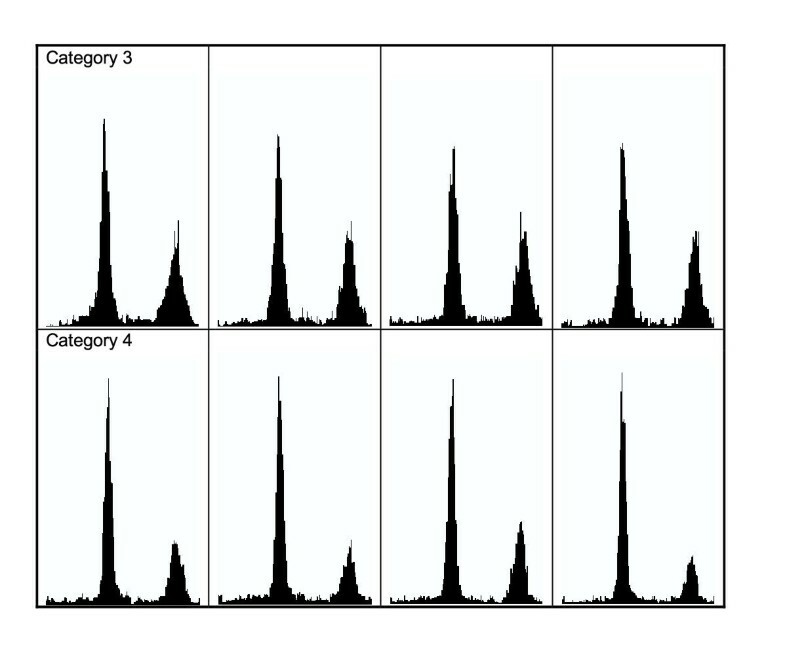 Flow cytometry histograms of synchronised HeLa S3 cells corresponding to categories 3 and 4. Each row corresponds to cultures irradiated with 5 Gy and assessed for nuclear DNA content approximately 13 h after release of the second thymidine block. * With alternate Helmholtz pairs active the background time-varying field in the non-active coils was found to be 0.38 μT. Cell cultures were housed in two hermetically sealed, cylindrical perspex flasks commensurate with the ± 2.5% uniform volume exhibited by the Helmholtz pairs (see legend to Figure 1A and 1B). Sealable openings were used to provide a 5% CO2 in air atmosphere and allow insertion of a temperature probe. Temperature control was achieved by housing the exposure systems in a 37°C hot-room and using an in-line duct fan to provide a fast air flow (maximum 460 m3 h-1) directly on to the flasks by use of ventilation ducting and a suitable Y-tube connector. Temperature differences between the two flasks were kept to within ± 0.1°C. Group 1 Cultures grown under normal conditions, i.e. 37°C in a 5% CO2/air atmosphere. Group 2 As for Group 1 but continuously exposed to a 2mT, 50 Hz magnetic field with a perpendicular orientation relative to the cell monolayer. Group 3 Irradiated using a 137Cs source in the range 1–5 Gy. Subsequently cultured as Group 1. 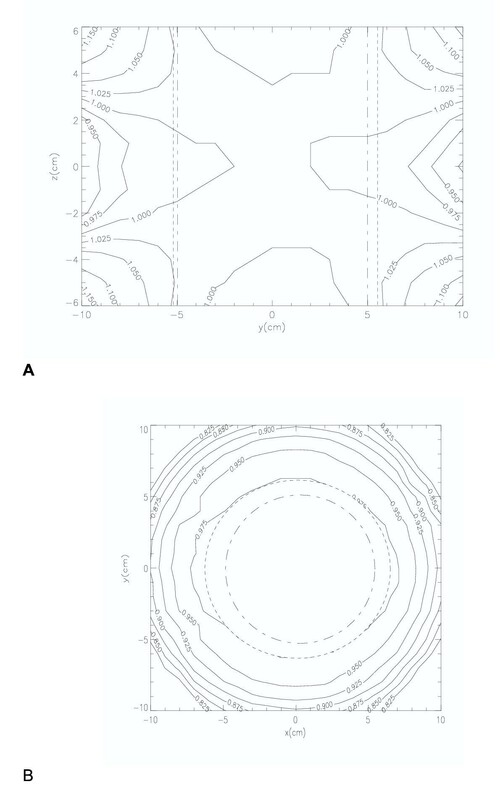 Group 4 Irradiated with 137Cs and then immediately and continuously exposed to a 2mT, 50 Hz magnetic field with a perpendicular orientation relative to the cell monolayer. The 137Cs irradiator was housed in a separate building resulting in a transit time of approximately 20 min before cultures were back in the hot room. Except for the time in the gamma-irradiation source, the cultures were kept in a polystyrene box with 37°C water bottles to maintain their temperature. Nuclei were isolated and stained with propidium iodide . Nuclear fluorescence (DNA content) was recorded for each cell of doublet discriminated populations with a Coulter EPICS Profile II machine. Not less than 10,000 nuclei were processed per sample. 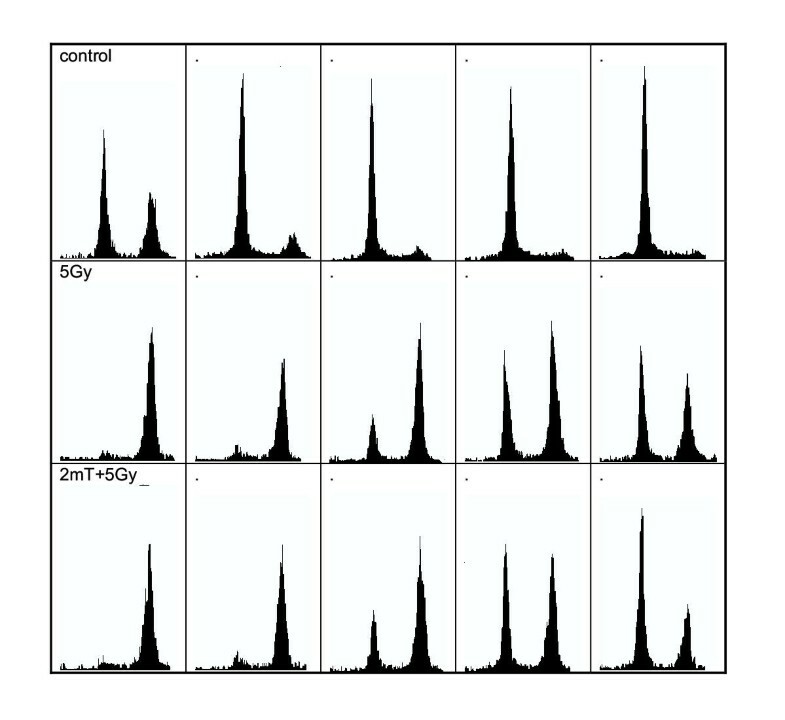 Cell cycle phases were obtained by decomposition of the frequency histograms by the half-peak reflection method, using an algorithm in "Cytologic" software (Coulter Electronics). PAH held a Medical Research Council Studentship and JL a Caledonian Research Foundation Scholarship during this course of this work. We also wish to thank the many people who offered their careful and useful critical comments of these studies and the manuscript prior to submission.